As the parties involved in Syria’s five-year civil war prepare to meet in Geneva Friday, questions about the future of the Damascus regime and the role of opposition groups continue to divide the world. Delegates representing the government of President Bashar al-Assad and rebel groups are expected to gather in Switzerland following a four-day delay with a view to inching closer to achieving the two-year road map declared last month. It is still unclear which groups will attend as the UN’s Syria envoy Staffan de Mistura has not revealed who received an invite on Tuesday. On Dec. 19, the UN Security Council unanimously backed a resolution outlining a framework for a political transition in Syria. The first step – for warring sides to come together – will hopefully be realized on Friday. Those initial meetings will have the simple goal of raising sieges and allowing humanitarian access to malnourished civilians. Next on the agenda will be the implementation of a cease-fire within six months and, ultimately, elections to be held in the following 18 months. The central issue facing the delegates and the UN team attempting to achieve consensus is what will happen to Assad. Regional powers that support groups opposed to the Assad regime want a time frame established for Assad to step down while the U.S. sees him stepping down in the middle-term. The government’s supporters, chiefly Russia and Iran, have called for Assad to be part of the transition process. The Geneva negotiations will see the delegations placed in separate rooms with UN staff shuttling between them in an effort to iron out a deal. Members of International Syria Support Group – including representatives of the UN, the Arab League, the EU, regional nations as well as China, Russia and the U.S. – will be present during the talks. Turkey, which like other neighboring states has taken in a large number of Syrian refugees, is deeply opposed to Assad remaining in power. Ankara, which saw its 32-year fight against PKK terrorists in the southeast flare up six months ago, is also opposed to the Syrian Kurdish group the Democratic Union Party (PYD), which is affiliated to the PKK, taking part. Unlike Turkey, the U.S. does not consider the PYD a terrorist group while Russia is trying to get the Kurds accepted in the talks as an opposition group. Turkey, the U.S. and EU have all listed the PKK as a terror organization. According to Turkish diplomatic sources, the U.S. previously supported the PYD’s inclusion but stepped back after pressure from Turkey. The group has reportedly not been invited to the talks. 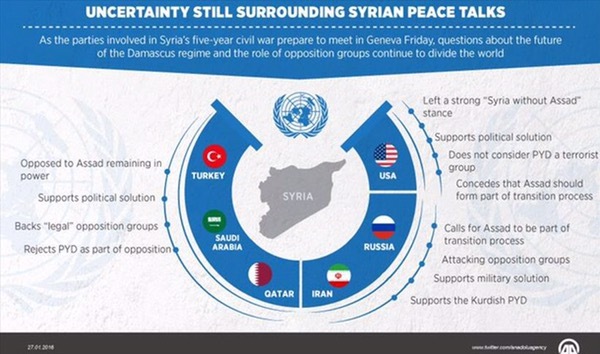 Turkey’s Syria policy is fully supported by Qatar and Saudi Arabia – a policy that involves backing “legal” opposition groups at Geneva and extends to endorsing discussion with the regime. Moscow’s priority is to secure their traditional ally Assad. To this end, Russian warplanes have attacked opposition groups considered “moderate” and supported by the West and regional powers such as Turkey and Saudi Arabia. In the run-up to the talks, the regime has made military advances on the ground in Syria with Russian air support and this support will boost Assad’s delegates at the talks. Iran, which is supporting Assad with Iranian boots on the ground as well as through the Lebanese Hezbollah militia, is also opposed to his removal. Despite both supporting Assad, Iran and Russia are divided by one main issue, namely Israel. Russia has close ties with Israel while Iran and Hezbollah are its deadliest enemies. According to Tel Aviv, Russian aircraft have crossed into Israeli airspace while conducting missions in Syria and there have been claims that Israel has bombed Hezbollah in southern Syria without interference from Russian warplanes. While the U.S. once adopted a strong “Syria without Assad” stance, this position has taken a back seat as it focuses on combating Daesh. In 2013, the use of chemical weapons against civilians by the Syrian regime threatened a U.S. military campaign against Assad but when this failed to emerge, Moscow was encouraged. Russia’s direct involvement in Syria from last September came as U.S. President Barack Obama was facing his final year in office and the U.S. was focused on the presidential race – both of which strengthened Russia’s position. The U.S. has now backed away from demanding Assad’s removal and has effectively conceded that he should form part of the transition process. Washington has also supported the Kurdish PYD in its fight against Daesh, which controls around 40 percent of Syria, amid allegations that the PYD is colluding with Assad’s forces. Fellow UN Security Council member China has opposed foreign intervention in Syria since the conflict erupted in March 2011, arguing the war should be resolved politically according to the will of the Syrian people. Neighboring Lebanon has followed a cautious policy that is focused on preventing the conflict seeping across its borders. Hezbollah has a strong influence on Lebanese politics. In Egypt, President Abdel-Fattah al-Sisi is another supporter of Assad retaining power for the time being. The main opposition representation at Geneva may be the Saudi-backed High Negotiations Committee (HNC), although it had not confirmed its attendance 24 hours before the talks were due to start. The committee, which excludes the PYD and other opposition groups the HNC says are close to the Assad regime, has insisted it must be the sole opposition delegation at the negotiations. The HNC has also demanded an end to attacks on civilians and blockades and the release of those arbitrarily arrested by the government. The group has asked for an assurance from de Mistura that these confidence-building measures will be taken.